For the film, see Starsky & Hutch (film). For the song by LL Cool J, see Phenomenon (LL Cool J album). For the video game, see Starsky & Hutch (video game). Starsky & Hutch is an American cop thriller television series, which consisted of a 70-minute pilot movie (originally aired as a Movie of the Week entry) and 92 episodes of 50 minutes each. The show was created by William Blinn, produced by Spelling-Goldberg Productions, and broadcast from April 1975 to May 1979 on the ABC network. It was distributed by Columbia Pictures Television in the United States and, originally, Metromedia Producers Corporation in Canada and some other parts of the world. Sony Pictures Television is now the worldwide distributor for the series. The series also inspired a theatrical film and a video game. The series' protagonists were two Southern California police detectives: David Michael Starsky (Paul Michael Glaser), the dark-haired, Brooklyn transplant and U.S. Army veteran, with a street-wise manner and intense, sometimes childlike moodiness; and Kenneth Richard "Hutch" Hutchinson (David Soul), the divorced, blond, Duluth, Minnesota native with a more reserved and intellectual approach. Under the radio call sign "Zebra Three", they were known for usually tearing around the streets of fictional "Bay City, California". The vehicle of choice was Starsky's two-door Ford Gran Torino, which was bright red, with a large white vector stripe on both sides. They used around four different cars for filming. Earlier shots had red wing mirrors usually for long shots or footage used in later episodes, close ups and later episodes had silver wing mirrors. The Torino was nicknamed the "Striped Tomato" by Hutch in the episode "Snowstorm", and fans subsequently referred to the car by that nickname, too. However, this moniker didn't come from the writers, it came from a real-life comment that Glaser made. In a segment titled Starsky & Hutch: Behind The Badge that was featured on the first season DVD collection, Glaser stated that when he was first shown the Torino by series producer Aaron Spelling, he sarcastically said to Soul, "That thing looks like a striped tomato!" In characteristic contrast, Hutch's vehicle was a battered, tan, 1973 Ford Galaxie 500. It occasionally appeared when the duo needed separate vehicles, or for undercover work. However, the duo's cover was often blown because Hutch's vehicle had a bad habit; when its driver's side door was opened, the horn would go off, instantly drawing attention. It was also noticeable due to the severely cluttered back seat, so cluttered that there was no room to transport both prisoners and the two detectives simultaneously. The detectives' main confidential informant was the street-wise, ethically ambiguous, "jive-talking" Huggy Bear (Antonio Fargas), who often dressed in a flashy manner and operated his own bar (first named "Huggy Bear's", and later, "The Pits"). The duo's boss was the gruff, no-nonsense-but-fair Captain Harold C. Dobey (Bernie Hamilton in the series, and gravel-voiced Richard Ward in the pilot, only). Starsky and Hutch continued the 1960s trend in some prime-time, U.S. TV dramas of portraying African-Americans (e.g., Huggy Bear, Capt. Dobey) in a positive light. Series creator William Blinn first used the name Huggy Bear on-screen for a character, also a confidential informant, in an episode penned by Blinn for the TV series "The Rookies", during the 1973 second season, "Prayers Unanswered Prayers Unheard", there played by actor Johnny Brown. In contrast to police characters on U.S. TV in prior years, Starsky and Hutch were open with physical gestures of friendly/brotherly affection toward one another, often declaring that they trusted only each other (in an "us against the world"-type sense). While likely "normal" by the social standards of 1990s-and-later America, such body language conflicted with 1970s norms of (emotionally restrained) masculinity. In a blooper tape made during the show's run that can be found on YouTube, the narrator intones that some Hollywood industry types referred to the characters as "French kissing prime-time homos". Soul verified this statement in a 1999 cast reunion interview in the United Kingdom. Season 1: Starsky & Hutch aired on Wednesday nights at 10pm and aired against the long forgotten Kate McShane on CBS and the second season law drama Petrocelli on NBC. Starsky & Hutch had no trouble beating its competition and finished #16 with a 22.5 share in the A.C. Nielsen Ratings. Season 2: Starsky & Hutch was moved to Saturday night for the second season and was up against tough competition on CBS with the Mary Tyler Moore Show followed by The Bob Newhart Show. NBC had the NBC Saturday Night Movie. Although the show lost some of their viewers from the move from the Wednesday night time slot from the previous season, Starsky & Hutch held their own finishing #34 with a 19.6 rating in the Nielsens. In 1977, a rising concern in America about violence on TV, along with Glaser's own concerns about the level of violence in the series, forced the writers to reduce the violent "action" scenes, use more romantically and socially themed storylines, and play-up the "buddy-buddy" aspect of the show's leads even more. At the same time, the lead actors—Glaser in particular—became jaded with the general theme of the series. These and other factors contributed to the fading popularity of the series. Glaser indicated several times that he wanted to get out of his contract and quit the series; he even sued the producers to force a release from his contract before the start of the third season. It seemed that he would not be returning for filming, so to fill the presumed void, the character "Officer Linda Baylor" (played by Roz Kelly) was created, and a number of alternative scripts featuring her instead of Starsky were written (whether the show's name would have remained the same, is unknown). After being granted more creative control over scripts, opportunities to direct episodes, and a per-episode pay raise (to $35,000, up from $5,000), Glaser returned to the show. Ultimately, Officer Baylor only appeared in one episode (alongside both Starsky and Hutch): the Play Misty for Me-inspired episode, "Fatal Charm". Season 3: Although a major change in the tone of the show, with a lot the violence ejected and more of a focus on the friendship of the two leads,viewers still showed up to watch their favorite Bay City Police Officers. From September to December 1977, the show stayed in its Saturday Night time slot, now up against The Jeffersons and The Tony Randall Show on CBS and the NBC Saturday Night Movie. In January 1978, the show moved back to it original Wednesday Night time slot of 10PM. The ratings dropped a little bit, however Starsky & Hutch finished #33 (tied with ABC's Lucan) with a 19.2 Nielsen rating. The final episode, Sweet Revenge (which has Starsky fighting for his life after being gunned down), originally had its co-lead dying in the early drafts. However, the producers decided to have the character survive, as it was felt that a dead Starsky would disrupt the continuity of reruns/syndication, and preclude the option of the producers' reviving the series in the near future. Much of the series was shot on location in the Los Angeles beach community of San Pedro. The building that was used as the Metro Division police headquarters is now San Pedro's City Hall. For their fourth and final season, Starsky & Hutch finished #36 in the Nielsen Ratings. Sony Pictures Home Entertainment has released 4 Seasons on DVD in Regions 1 and 2 between 2004 and 2006. As of 2014, these releases have been discontinued and are out of print. In France, the show was shown on TF1 between 1978 and 1984, and subsequently on other channels. The French version replaces the original theme(s) with a French song, singing about "Starsky et Hutch". The voices of the two French actors dubbing the series, who also introduced much more fun and jestering in their role, played a part in the popularity of the series in France. One of the voice-over actors later said that David Soul had acknowledged that him and Paul Michael Glaser had to be much more restrained when they played. In the United Kingdom, the series was an immediate hit when it began showing on Friday nights on BBC1 (debuting 23 April 1976, and soon catching up with US broadcasts), with occasional re-runs through to the early 1990s. It was re-run by Five in 2003 in a 10 a.m. slot (later 11 a.m., and eventually moving to a 2:30 p.m. slot); During its prime-time run, however, the BBC heavily edited or skipped altogether certain episodes; in fact, the first season episode "The Fix" (in which mobsters inject Hutch with heroin in order to extract information from him) was deemed too graphic and was effectively "banned" from all the corporation's runs of the series (despite being shown after the 9 p.m. 'watershed'). Several other controversial episodes did on occasion air, but were heavily edited and / or seldom aired due to their nature. "The Fix" was never shown on British terrestrial television until May 31, 1999, as part of Channel 4's "Starsky & Hutch Night" (which also included the pilot, The Word On The Street - a documentary about the series - and the second season episode "Gillian"). On January 10, 2003, Five actually broadcast "The Fix" in their regular 10 a.m. slot; however, the episode was notably edited, and the scene of Hutch being injected with heroin was almost completely absent. The series was also shown on the UK satellite channel Granada Plus, and is now running on Zone Thriller, which was rebranded as CBS Action in November 2009. The channel has broadcast all episodes, with minor edits in a few cases. In Australia it airs on Digital Channel Go!. In 2014, it started to be shown on 7mate. In Mexico it was broadcast in Televisa. Originally, Blinn was to have Starsky drive a Chevrolet Camaro convertible because he fondly remembered a green and white one that he owned. However, when production started on the pilot episode, Ford Motor Company's Studio-TV Car Loan Program was the lease supplier for Spelling-Goldberg. They looked at lease stock and chose two 1975 351 Windsor V8-powered (VIN code "H") "Bright Red" (paint code 2B) 2-door Gran Torinos. Both cars had a role in the pilot movie, one being "Starsky's" car, and the other being a similar car which is mistaken for Starsky's car by the film's villains. They each had body-side mouldings along with a black interior with vinyl bench seats. Interestingly, one of the pilot cars had the luxury remote-control chrome mirrors installed, while the other pilot car had the cheaper, entry-level manual chrome mirrors installed; in editing the film, Starsky and Hutch are shown to be driving around in each of the two cars at different times during the film. The cars were also custom painted (on top of the factory red paint colour) with the distinctive white "vector" stripe designed by Spelling-Goldberg's transportation coordinator George Grenier. The rear ends were lifted by air shocks, and had "U.S." brand 5-slot mag wheels added with larger rear tires. While the tires were mounted so that only the black wall side would show, thus hiding any unauthorized brand-name display, in one first season episode ("Kill Huggy Bear"), a close-up shot of the villain cutting the rear brake lines shows the letters on the inside-facing side of the tires to say Firestone. In the "Behind The Badge" interviews, Glaser said that during the early stages of production of the pilot, Spelling took him outside to introduce him to the red & white-striped, mag-wheeled Torino. Glaser took an immediate and long-lasting dislike to the car, which has not changed to this day. According to Glaser in several early interviews, there were three main reasons why he instantly hated the car: First, in his opinion, it was big, ugly and childish-looking. Secondly, the idea that two undercover cops would drive around in a car with such an outlandish appearance seemed ludicrous, and lastly, he doesn't like Ford products (although in a picture that was printed in an issue of the National Enquirer, Glaser is shown on the side of a California freeway with a flat-tired Ford Explorer). At the first viewing of the car with David Soul (Hutch), Glaser remarked that the car looked like a "striped tomato." That nickname stuck, and very soon the show's writers had worked it into the show as Hutch's derogatory name for Starsky's beloved Torino. Glaser remarked to Soul that he hated the car and that he was "going to destroy that car...burn it down every chance I get! ", and repeated the story in the 1999 "reunion" interview. Several scenes of Glaser driving the car show him smashing the front wheels into curbs as he slides the car around corners and such, but that may also be attributable to the fact that he is primarily an actor, not a trained stunt-driver. Over the years, with the Starsky & Hutch Torino gaining in popularity and becoming a much-loved icon of the show and of the Seventies in general, Glaser has not so much grown to appreciate the car as he has learned to simply accept its popularity as a necessary component of the fans' appreciation of the show. In fact, during filming of the 2004 Starsky & Hutch movie, Glaser had several opportunities to sit in the newest iteration of "his" car, and even drive them, but he refused. He just was not interested; however, in 2004, during the last day of filming a movie in Canada, the crew wanted a group picture of Glaser with a Starsky and Hutch Torino, so he agreed to sit in the driver's seat of a Limited Edition replica with the crew surrounding the car . In the summer of 2012 during the introduction to the "Las Vegas Car Stars 2012" charity event, Glaser drove up in a S&H Torino replica; after being introduced by the master of ceremonies, he got out of the Torino and was cheered by the crowd. New high performance engine sounds were dubbed over scenes during the show because California law forbade mechanically modifying the engines of new cars. When the pilot was successful, Spelling-Goldberg ordered two new 1975 red Gran Torinos for the first season. These cars were powered by 400 V8s (VIN code "S") because extra power was going to be needed for additional stunt driving scenes. These new cars for the first-season were factory ordered in the bright red color (Ford paint code: 2B), which was a regular production color for 1975 Torinos. They were powered by 460 Lima V8s (VIN code "A"), and Spelling-Goldberg kept these Torinos until production ceased. While these were the biggest, most powerful engines available from Ford at the time, they were still somewhat underpowered at 202 net horsepower (224 with factory optional dual exhausts, although the engine still produced abundant torque (pre-smog high compression 460s produced approximately 280 hp net). A third car, owned by 20th Century Fox and 351 Windsor powered, was used as the first backup to the Ford lease cars. Towards the end of the four seasons of production, the Torinos were noticeably worse-for-wear, and close watchers of the later episodes will spot many dents and other damage on the cars as they appear in various episodes. In particular, the driver's side quarter panel and tail-light area were seen to be smashed up in a couple of different 4th season episodes, and at least one of the cars was shown to have a dented and twisted front bumper along with some visible damage to the grille behind. The very last appearance of the Torino on the series seems to show that the driver's door and window will not even close correctly, possibly due to the rigours and effects of the spirited stunt driving the car suffered over the years. After Starsky and Hutch was cancelled, the cars were returned to Ford and sold at auction. first it was sold to AE Barber Ford of Ventura California A Ford Dealership, the first sale of the Hero car 1 # was to Man from Ojai, California. He owned it for about one year then it sold to An Air Force colonel that had for some 17 years. For many years, Torino #1 was owned next by an Ohio resident; however, he sold it in 2012 to Cars of the stars Motor Museum in United Kingdom. Some years later, Torino #1 was sold to Dezer Car Collection in Miami, Florida. Most recently Dezer sold in private auction in January 2015 to a Texas collector it remains mostly Unrestored and somewhat battered due to every day wear and tear from second owner who acquired car #1. It still has its original 460 V8, interior, and paint. But the Mickey Thompson valve covers and chrome Air Cleaner seen in so many pictures had been added by the first owner it was not the way he purchased it from AE Barber Ford. Torino #2 is owned by a New Jersey man who supplied the main close-up Torino (featured on the movie posters) for 2004's big-screen Starsky & Hutch movie. During its life after Starsky and Hutch, #2 was wrecked and sold as salvage. It was repaired, although it was repainted the wrong shade of red and the iconic stripe was improperly painted. Although still equipped with bucket seats, #2 no longer has its original 460 engine, which was replaced at some point with a 2.8 litre Ford V-6. The car underwent a full restoration in a Pennsylvania Shop and is back on the road . Finally, the 20th Century Fox Torino was purchased in 2009 by the owner of #2, sold to an Oklahoma couple in 2010, and restored. "Unit 129" is owned by a collector in New Hampshire. In addition, the Torino has many fans and collectors in the United Kingdom, as evidenced by the large number of UK-owned replicas (both factory and aftermarket). As stated previously, Glaser was not fond of the Torino as he found the car to be garish. Due to his contempt for the Torino, he deliberately mistreated the cars during close-up stunt scenes when he drove (this was admitted to in a 1997 letter he wrote to the owner of the #1 Torino; and in a first season DVD interview he said that tried to "destroy" the cars) and would often stop the car by hitting the front wheels against curbs, as well as coming into driveways at high speed and bumping into garbage dumpsters. In the pilot episode, Starsky carries a Beretta which he identifies as such in an early scene while the two are sitting in Hutch's car doing a weapon inventory, but once the series began, Starsky carried a M1911A1 Colt pistol, as seen in the opening theme of season 1. A Smith & Wesson Model 59 (9mm) can be clearly identified in a close up scene near the end of "The Fix", the 4th episode of Season 1. In the pilot episode, Hutch carried a .38 (also identified during the same weapons inventory scene), but carries a Colt Python .357 Magnum revolver through the series entire run. Hutch's weapon was a medium-barrel length at the start of the series; however, in the third first-season episode "Texas Longhorn", the "Zak" character carried a long-barreled model, and Soul subsequently asked to carry that version from that point forward. The criminals carry a variety of guns: rifles, shotguns, pistols and revolvers in a variety of makes, models, and calibers. The first season of the show had a dark and ominous theme written by Lalo Schifrin that seemed to fit the hard action and violence of the season; the main title version was edited down from the chase climax cue of his score for the pilot episode (the climax contains the shot of Hutch leaping off a fire escape and landing on a car which appears in the opening titles of all subsequent episodes). The end credits featured a similar piece of ominous music. A theatrical film produced by Weed Road Pictures and Red Hour Productions and distributed by Warner Bros. and Dimension Films was released in theatres on March 5, 2004. The film stars Ben Stiller as Starsky, Owen Wilson as Hutch and Snoop Dogg as Huggy Bear, as they attempt to stop a drug kingpin played by Vince Vaughn. The film grossed $170,268,750 worldwide. ↑ Ozersky, Josh (2003). Archie Bunker's America: TV in an era of change, 1968-1978. SIU Press. p. 120. ISBN 0-8093-2507-1. ↑ "Site News DVD news: Mill Creek Licenses 52 TV Shows from Sony for Low-Cost DVD Release - TVShowsOnDVD.com". ↑ "Starsky and Hutch DVD news: Update about Starsky & Hutch - Season 1 - TVShowsOnDVD.com". ↑ "Starsky and Hutch DVD news: Announcement for Starsky and Hutch - The Complete Series - TVShowsOnDVD.com". ↑ "Starsky and Hutch - BBC One London - 23 April 1976 - BBC Genome". 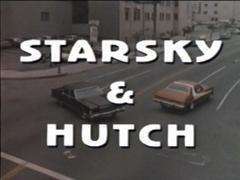 ↑ "Starsky and Hutch - BBC One London - 30 April 1976 - BBC Genome". ↑ "Starsky and Hutch (complete)". ↑ "Starsky & Hutch (2004)". Box Office Mojo. Retrieved 2010-02-05.